MWS recently spoke with powerhouse and Makeup Artist Sian Richards about her upcoming film Black Panther, working in the industry and creating her own line of cosmetics. This woman truly does it all! 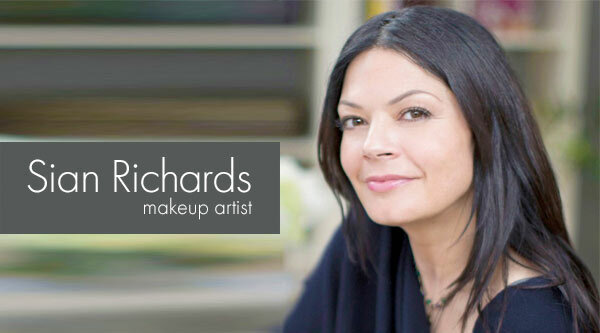 MWS: You’re a second generation makeup artist… your dad, Hu Richards, was a film makeup artist, so you really grew up on set. Would you say the lure for you was more about film sets or makeup? They both have so much magic! SR: To be honest, I was so young that it was the entire experience. The smells, the lights, sets, makeup room! It was like this glorious cornucopia of Narnia to me! But I knew the smell of makeup before I even knew what makeup was! MWS: The span of your work is absolutely inspiring. You got your start on the iconic British mini-series Prime Suspect, making corpses. That seems like diving into the deep end! How did that first job feel? SR: Well, that first job was as an assistant! My friend Colin Ware (whom I met at makeup school when we were 18 – friends ever since) landed the gig. It was very groundbreaking stuff because there wasn’t even an award they could give Colin as it didn’t exist for this type of work in tv. I remember us in his Dad’s garage in Manchester working through the night surviving on coffee and tea – Coca Cola for Col – and he created the most glorious fully articulated, weighted corpse. Even when you looked at her with the naked eye, that Della Mornay corpse blew your mind – but I can’t accept credit for anything other than being a team player and lunatic! So I was corpse team only to clarify, not main makeup team. I was 21 years old! MWS: Film work is a delicate combination of meticulous preparation and the ability to think on your feet. Can you share any stories about your early career in which you had to be truly resourceful? SR: My first feature as a Dept Head was thrust upon me when I was 28. I had never even been in a main trailer! Unable to get a job in film – not enough work and those working hire the same people, so if you were, like me, new, you were screwed! Couldn’t get a job in tv because as the then head of makeup at Granada TV said to me when she looked at my portfolio, I was overqualified to powder news readers and they didn’t have new positions for someone with my skill set. So I did a 180* turn and thought.. Stuff this nonsense! And I went and joined a model agency as their makeup and hair person – also did styling; we did it all back then – and entered into the world of fashion and advertising… by the time I got offered that first movie as dept head, I had been working in stills, music and commercials. I got the movie on star request and one of the leads was David Bowie! I was 28!!! I hadn’t broken down a script, had never needed to hire a crew or arrange prosthetics and squibs. So I taught myself! Richard Branson once said that if you get offered something amazing and you do not know how to do it, you just say thanks and find out how to bring it home; don’t ever let anyone know you can’t do it unless you don’t want to do it. That’s exactly what I did at that time. MWS: Film conditions are notoriously grueling, and you’ve been in the business for over 20 years. Would you say that the difficult conditions contribute to the creative process? Are the rough circumstances part of the fuel in a way? SR: Definitely not!!! Anyone working those sorts of hours will confirm that we need shorter work days and safe travel home times where we can drive home and not crash from exhaustion!!! One thing I will say though is that when a movie is challenging to the entire crew and we are all going through the same process, we know that this show will be amazing. We knew it on Apocalypto and we knew it on Black Panther. When a crew has a united vision to create something amazing; it changes from a job to a work of love and the energy of that film shifts. Go and see Black Panther or Apocalypto and you will see what I mean. MWS: You’ve done glamour work, every day makeup, period pieces and wild transformations. Do you have a favorite genre to work in? MWS: What was it like creating looks for Chadwick Boseman on Black Panther? This movie comes with great anticipation and feels like it’s really a big moment. Were you aware of that going into it? SR: You are right! This moment is HUGE. We are in a time of awareness and openness to understanding in ways we have never been. Yes, I knew how important this movie was and my intention was to be as honorable and reverential to all African nations. I’m so tired of preconceived ideas and judgments held by those who do not understand and so when I designed each of Chadwick’s looks, it was with all of this in the back of my mind. I always knew this movie would be explosive. MWS: When you’re working on something like Cloud Atlas or Black Panther, where the looks are truly inventive and new, where do you draw inspiration? Can you tell me what the process is like from conception to creation? SR: I go feral! Lol. For Black Panther I went and looked at every tribal ritual book I could lay my hands on and also every body painting book I could read. Lupita gave me a fabulous book which taught me about the ceremonies themselves and how every stroke has a meaning when they apply their paint. From that point onwards, every thing I designed or painted had meaning and intention and the difference is noticeable I think. Chad spotted it right away and embraced everything I did.. I also wanted his input as much as possible because I love brainstorming with him… we spent many nights back and forth messaging and talking through ideas and textures. MWS: What inspires you most in day to day life? Do you see looks on the street that inspire you? SR: I draw inspiration from everywhere – check out my Instagram and you will see! MWS: You’re also the founder of London Brush Company, now Sian Richards London. What made you decide to create your own makeup line? What can you tell me about the products? SR: When I started LBC it was because I was starting a big movie, was new to LA and on trying to buy some decent makeup brushes for said job, could not find the quality I was looking for. That simple! I have recently rebranded from LBC into Siân Richards London since I launched colour – and I feel I have done enough to earn the respect from my customers to assume they even know my name and associate it with a great Indie Beauty Brand! Siân Richards London is a conscious Indie Beauty Brand that is pro driven first. All my products are created by me, are paraben and cruelty free and as much as possible, vegan friendly. I am an advocate for reducing our imprint on our planet and all this is factored into the brand. Instead of mass producing in China as so many brands now do (which is why you see so many identical products on the market), my stuff gets made in the USA and Canada. I believe in paying people a fair wage, not abusing workers, and in keeping the money in this country. We need it! MWS: Between raising a family, working in film and your company, you must not have a spare second! What’s the fuel that keeps you going? SR: I don’t! But last year made a rule that my daughter and I take three weeks during summer to travel every year, which is essential! How am I fueled?? Well if you ever met my late mother you would know! I, just like her, have a fierce life force and have been blessed with stamina. Not to say I don’t get completely exhausted – as I am today – and in that case, I now go to bed and rest rather than push myself further. Sleep is essential. MWS: What’s your relationship with Manhattan Wardrobe Supply and how has it developed over the years? SR: MWS started stocking a few skus of LBC a few years ago and Tommy was gracious enough to put up with me through those years! MWS is great and I want a flagship store in NYC where I can provide a great pro discount for those on the east coast. Tommy will enable all of this and it is starting with a private shopping event for pros only on March 4th! Sian Richards London will be at MWS for a private, industry only shopping event on March 4 from noon-6pm. Fizz & Nibbles, Demos & Inspiration, Networking & Laughter all to be had! Tickets available here and are redeemable against purchase. Tagged Black Panther, film, Makeup, makeup artist, Pro Makeup, Sian Richards, Sian Richards London. London Brush Company, Women In Film. Bookmark the permalink.